The movie to accompany the Late Rembrandt exhibition. A worthy substitute for those who missed it, and an essential companion for those who went. Arts Alliance Media; Seventh Art; The National Gallery; Rijksmuseum. Region free, exempt classification. 5 060115 340434. We all of us know Rembrandt, but until the current exhibition focussing on his late works, few of us really knew him that well. Most widely associated with his vast painting popularly known as The Night Watch, and his many portraits, he may not today come across as being too revolutionary. The National Gallery and Rijksmuseum teamed up to correct this, with a once-in-a-lifetime chance to see most of the major works which Rembrandt painted, drew, and etched over the last decade or so of his life. This movie is based on that exhibition, which I visited in London in October 2014, and is also accompanied by the book of the exhibition. However you should not expect this movie to take you on a tour of the exhibition. Instead it will explain something of the historical setting of the Netherlands at the time of Rembrandt, his biography, the painting and printing techniques which he used, and why these late works are so different and so important. Although no movie can ever match the experience of seeing paintings in the flesh, this movie is a valuable adjunct to both exhibition and book. The slight snag here – and my only significant criticism of the movie – is its preference for non-linear narrative. Like it or not, most viewers find things simpler if what happened in 1643 is explained before moving on to what happened in 1666. I appreciate that philosophically that may not always be the way that our minds work, but it makes complex stories much easier to follow. So when we have been considering some of the themes of his paintings after 1650, it is somewhat disorienting to be suddenly parachuted back to his biography in 1633. Thankfully the high quality of the script and images mitigates any confusion, and at least with a DVD you can hit the pause button to take a breather during which your mind can catch up with the director’s. Following some opening shots of modern Amsterdam, with Robert Lindsay’s wonderful narration, we are taken to the National Gallery in London. There is a slight incongruity here, in that the movie shows the regular main entrance and gallery, whereas its Rembrandt exhibition was accessed through, and housed in, the modern Sainsbury Wing, but I am picking nits. The key experts are then introduced. 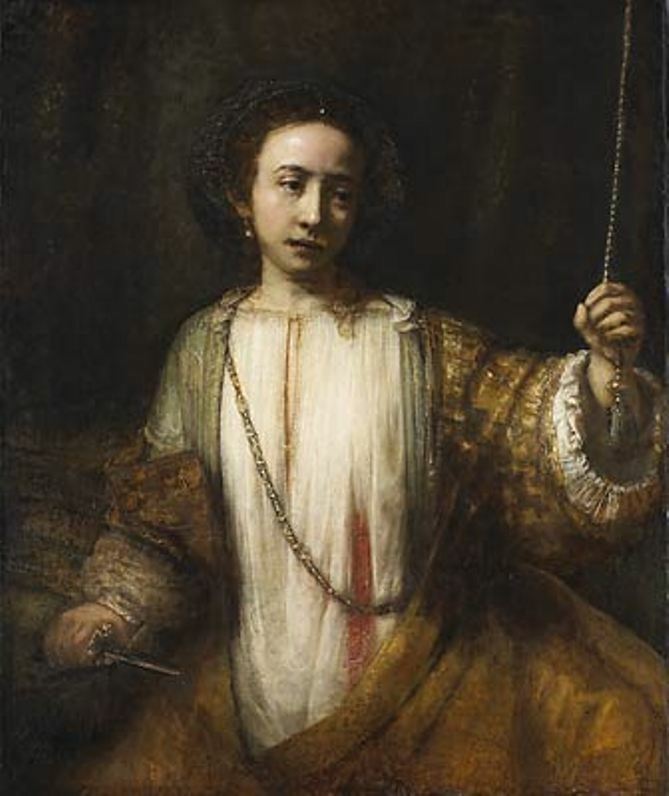 Among them Betsy Wieseman of the National Gallery seems to have been the mastermind behind the exhibition, her objective being to make the visitor fall down and weep in the last room, because of the emotions that Rembrandt’s works have engendered. Although I may have internalised my response behind my stiff upper lip, she certainly succeeded here. Her opposite number in the Rijksmuseum was Gregor JM Weber, and they are assisted in their explanations by Professor Evelyn Welch of King’s College London, and a small array of others. Although not all were as meaningful and authoritative, this team serves the viewer very well indeed. Background explanation about this period in the history of the Netherlands follows, mixing voices well, and illuminated by delightful animated illustrations. This leads to a detailed discussion of the Syndics of the Drapers Guild (1662), the painting which probably appealed least to me, but which is a good key to the more radical late works. The movie then drops out of this biographic thread for some words from Nicholas Penny, Director of the National Gallery, who disarmingly mentions that it and the Rijksmuseum have many Rembrandts of their own, and have good friends who have Rembrandts. This leads on to a section showing some of the preparations which were made for the exhibition, with excellent coverage of the conservation work involved in bringing paintings up to scratch for a major exhibition. Cutting back in the biographic thread again, we make progress with Rembrandt’s worsening situation later in life, with looming bankruptcy, ‘immoral’ relations with Hendrickje Stoffels, and finally the deaths of each of his family. During this we are treated to detailed examinations of A Woman Bathing in a Stream, both of his Lucretias, the Jewish Bride, and more. For me one of the high points was practical demonstration by Delores de Sade, with additional explanation from Erik Hinterding, of Rembrandt’s etchings. In retrospect I wish that I had seen that before I went to the exhibition, because of the greater understanding which it gives. Painter Richard Twose gives some practical demonstrations of some of the techniques that Rembrandt used, but I found that less satisfactory, and his anachronistic gaffe of mentioning Cadmium Red (not used in painting for 200 years after Rembrandt’s death) was jarring. Late in the movie there is an examination of the Conspiracy of the Batavians, a painting which I did not know before seeing the exhibition and which I found remarkable in scale, lighting and composition. A wonderful sequence of self portraits then accomplishes something that the exhibition itself could not, coverage from Rembrandt’s youth through to his final years. A short and dispensible discussion by AC Grayling then speculates as to whether Rembrandt might have met Descartes, an idea which seems very appealing to philosophers but is probably of much less significance to the rest of us. The final verdict is that Rembrandt was a timeless genius who was always striving for better: an opinion which is an apt summary of the exhibition, put under careful scrutiny in the book, and amply argued in this movie. If you did not get to the exhibition, then you must watch this movie in consolation. If you did go, then you will want this movie, and watching it (and reading the book) will fill in the many details that you probably missed at the time. The exhibition Late Rembrandt continues at the Rijksmuseum, Amsterdam, until 17 May 2015. If you have not seen this yet, this is your last chance to see these amazing works together. Favourite paintings 4: Rembrandt, Bathsheba with King David’s Letter, 1654. Posted in General, Life, Painting and tagged exhibition, movies, painting, Phil Grabsky, Rembrandt. Bookmark the permalink.